With the US markets closed yesterdays for the 4th July celebrations trading activity was decidedly muted with the euro vs dollar closing the forex trading session as a very narrow spread down candle which hovered marginally above the USD1.25 level as the short squeeze in the pair continues. 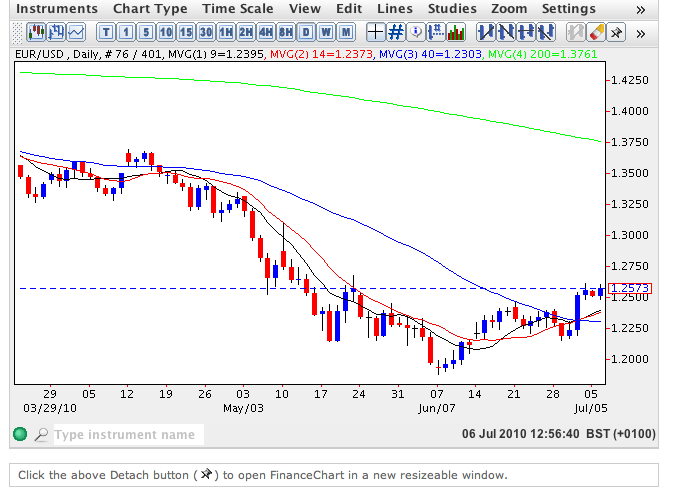 This short term bullish trend has continued into early trading this morning with the euro vs dollar once again trading above all three short term moving averages but well below the 200 day moving average which currently sits at a heady USD1.3750, so some way to go yet!! The extent of the present rally higher has surprised many and indeed there is a certain amount of confusion within the futures markets with speculators and hedge funds still holding net short positions on the expectation of a further decline in due course. Given the background fundamental picture this seems likely, and as a result we can expect to see the euro vs dollar roll over & sit below all four moving averages once again as it moves deeper to re-test support USD1.20 and beyond. USD1.18 still remains the key short term target and below this then USD1.15 becomes a possibility. With only the ISM non manufacturing PMI data due for release later today in the US and thin markets we can expect a degree of volatility in the euro vs dollar. Details of the fundamental news for euro vs dollar can be found at my new forex trading site.